When I left Japan in 2014, airbnb was still the wild west in Japan. The concept of sharing your home with strangers was unheard of – and unpopular in this space-obsessed private country.This 2015 NYT article covers some of the mavericks who joined airbnb in the early years. In 2013 and 2014 I was desperate to find places in Hiroshima on airbnb, and there was only one. But when I returned to Japan in 2017, the airbnb listings were numerous. 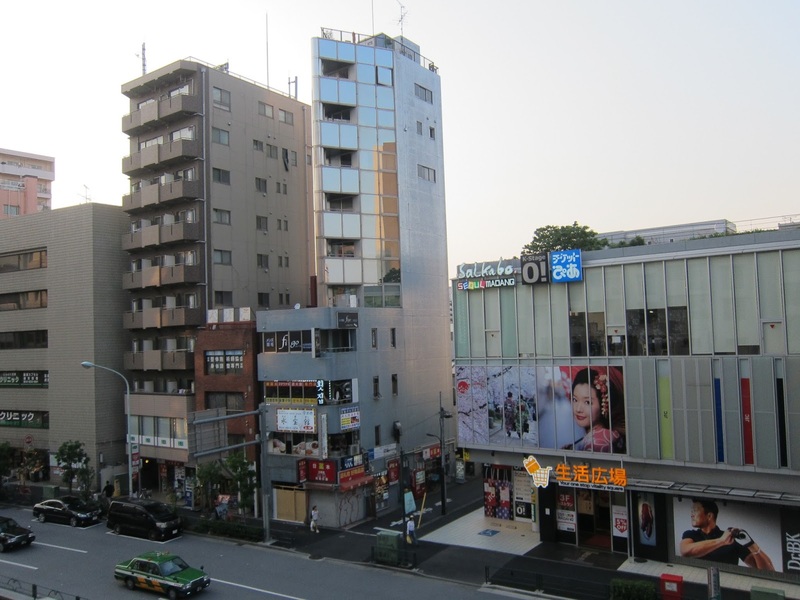 Especially off the Yamanote line in Tokyo, buying or renting a small condo in the city and turning it into an airbnb is a very lucrative investment. Many hosts have now taken up this venture and airbnb units are plenty. I jumped on this and stayed at a few airbnbs in Tokyo. Boy, did I get a taste of city living. I will remind you that I spent one year in a large traditional Japanese house in the countryside. This could not be more different. 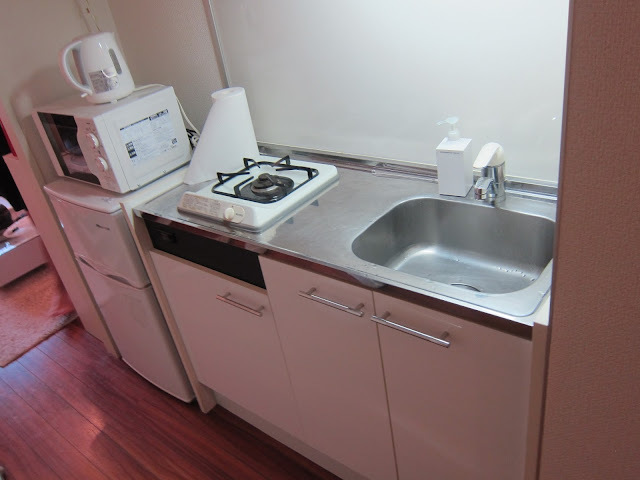 As you can see, studio apartments in Japan are tiny. Like so tiny there is scarcely room for you to lay your suitcase flat on the floor. 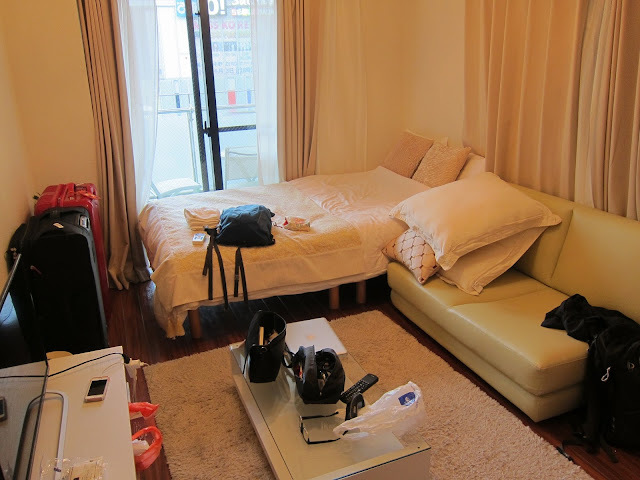 This particular room was actually the LARGEST of the other airbnbs we saw. It actually has a couch and TV. The others could only fit a double-size bed. Think of it like a college dorm without the desk or storage. The genkan (pictured right) is the entrance to a Japanese home. There is a small step separating the home from the doorway, and before you take that step, you must take off your shoes and leave them there. Against the wall there is usually some shelving space for you to store a few pairs of shoes. The hallways is a perfect spot to put a tiny kitchen. You will see that there is only enough room for a U.S.-sized mimi fridge, microwave, tea kettle, sink, and one gas top burner. Missing are an oven, dishwasher, and enough shelving to keep dishes and dried food. In Japan, the toilet and shower are always separate. This is actually really convenient and something I wish was standard in American homes. The bathtubs are also super deep which allows you to really submerge in the water. On the left, you see a photo of a typical bathtub, adjacent to the shower area. 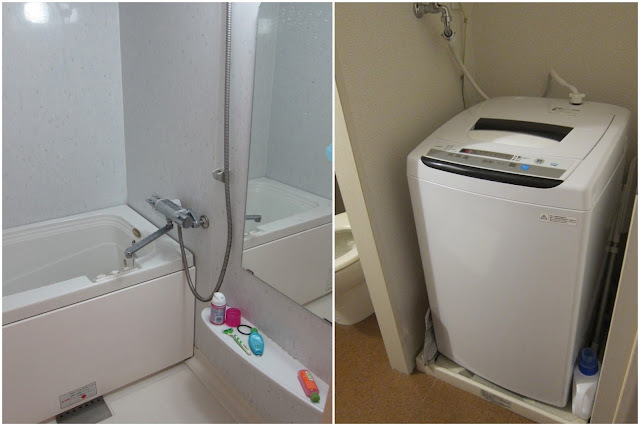 On the right, you see the tiny washing machine. Japanese homes rarely have a dryer, so you must hang the clothes outside to dry. 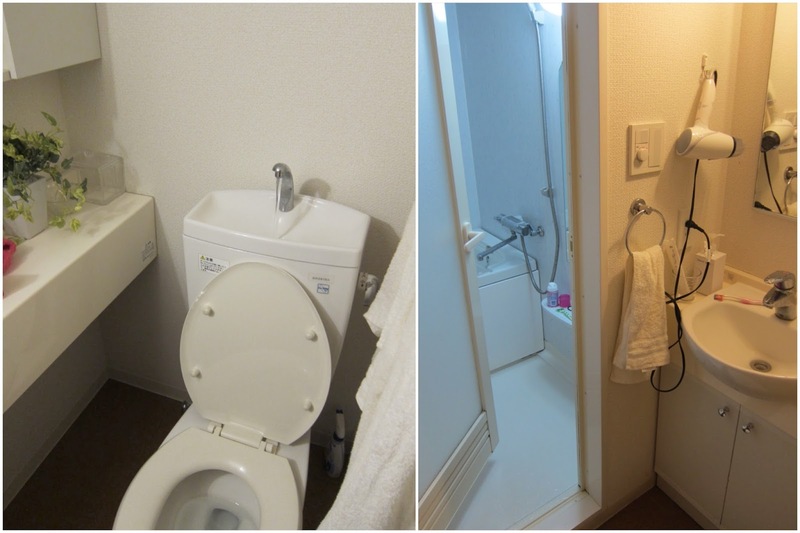 On the left, you see a Japanese toilet with a sink over the basin. The water automatically comes on when you flush the toilet. This allows you to wash your hands without wasting water by turning on the sink. On the right, you see the main sink and doorway to the bath/shower room. 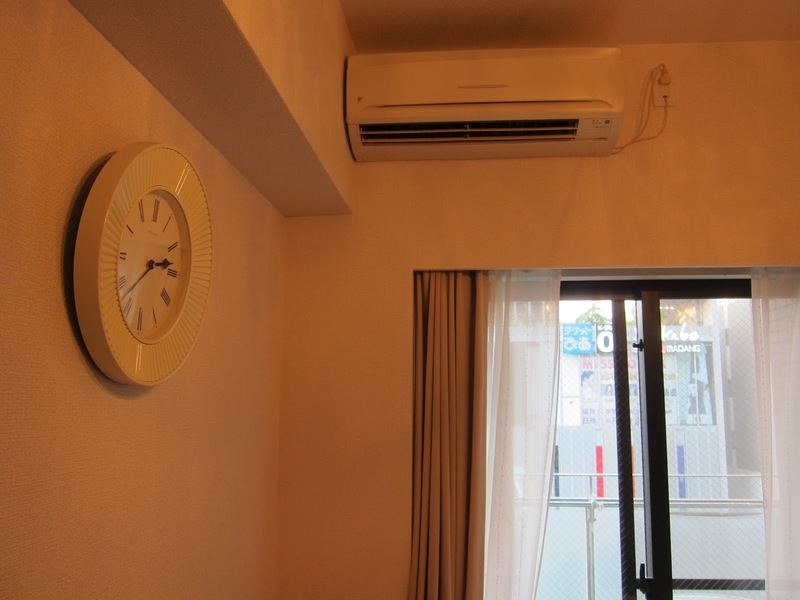 Japanese homes and apartments do not have central heating and cooling like American homes. Instead they use this machine you see on the wall. For a tiny apartment, this is all you need and its very efficient. But when I was living in a gigantic uninsulated house in the countryside, I had only one of these and it heated and cooled the space within 2 feet of it. The photo on the left is of the balcony. I've never seen a Japanese apartment that didn't have even a tiny narrow balcony. The purpose is not to savor being outside, but rather to hang your clothes so they can dry in the air. This balcony had a table and chair for foreigners, but I rarely (never) see Japanese people hanging out on their balconies. The balconies always become the de-facto clothing racks and outside storage. On the right you see the hallway, sparse and sterile. 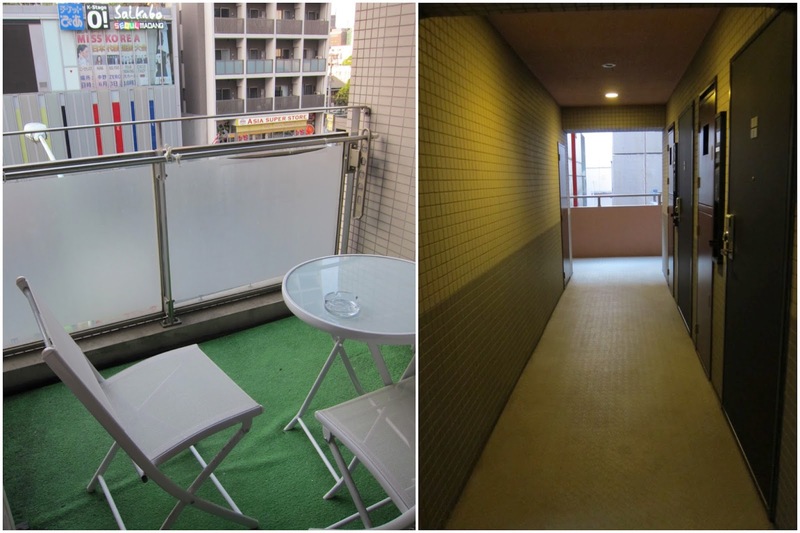 This particular apartment opened up to the outside which I have found is also pretty typical in Tokyo.